Read Mind on Movies review of Paddington 2. Paddington, now happily settled with the Brown family and a popular member of the local community, picks up a series of odd jobs to buy the perfect present for his Aunt Lucy's 100th birthday, only for the gift to be stolen. Paddington 2 is the sequel that brings viewers up-to-date on the happenings in Paddington Brown’s life. This polite and marmalade loving bear is once again having adventures in London and wants to get a gift that embodies the city for his Aunt Lucy’s birthday. Along the way Paddington runs into bumps but are the new adventures enough to keep this based on a book series alive? I am not sure if the director and writers read more Paddington books or what but this film truly felt like a storybook come to life. From the characters to the scenery to the animation meets the real world, Paddington 2 felt like Paddington had escaped from his books and jumped to the big screen. The characters really felt like they came alive in this as they were whimsical and very much like those out of a storybook. There are also several scenes where the “reality” of a situation gets mixed in to appear as if it is on a book’s page which was very visually pleasing to watch. The plot moves right along as if reading a book as well. Although there are twists and turns everything is intertwined in a way to keep viewers both entertained and wanting to know what’s on the next page (or in this case, scene). That is also indeed helped by the villain Phoenix Buchanan (Hugh Grant) who is a theater actor who takes theater to the extreme. He is constantly talking to himself (or rather his many characters) and had both kids and adults wondering about his sanity. His greed and villainy is a good contrast with Paddington’s sweet nature and had several viewers voicing their opinions or squirming in their seats because of it. Watching the first movie prior to is not necessary because Paddington 2 does a good job at covering the basics of what was missed but I still recommend watching it because you can see how far this series has gone since the four year gap. I will say though that this movie felt long toward the end and many of the younger viewers started to get antsy. 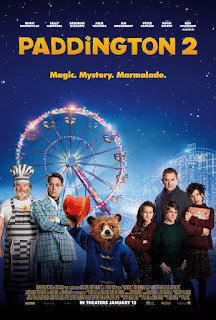 Overall I thought this movie showed the kind, accepting and marmalade loving nature of Paddington and brought the series where it needs to be. I am excited to see if there will be a third movie in the future and hopefully there won’t be such a long gap this time around. I never saw the first one but I don’t think that affected it at all. There’s a brief synopsis of how Paddington came to London and I think they did that for all the folks who didn’t watch the first. Paddington is a bear who lives in London and is trying to earn money to buy his Adoptive Aunt a pop book about London. It turns out the book is actually a secret treasure map and the villain, Phoenix, played by Hugh Grant stole the book to find the treasure. Now Paddington’s family must find out where the book is and rescue Paddington. This movie was more of a mystery, and in a way reminded me of National Treasure, going to landmarks to find clues. It was really fun and cute, I think if you have kids they will like this movie and you’ll enjoy it too!